Google has changed the doodle on its search page on the occasion of the 25th anniversary of the Independence of Armenia. 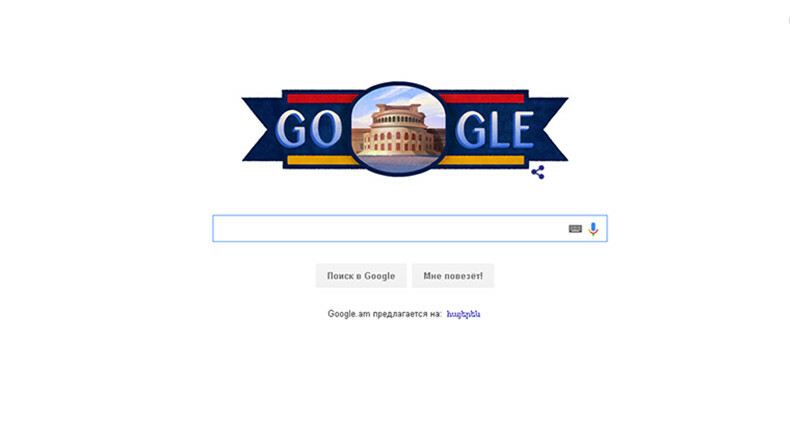 The doodle is an image of the Armenian flag and the Armenian National Academic Theatre of Opera and Ballet named after Alexander Spendiaryan. It should be noted that while spreading the doodle, “Happy Armenian Independence Day” message pops out. When clicking on the doodle, you can view relevant information concerning Armenia’s Independence. Edited by gamavor, 21 September 2016 - 01:58 PM. The following is a message that Serj Tankian has distributed on the occasion of 25 years of Armenian independence. Today marks the 25th anniversary of Armenian independence. We should take the opportunity to celebrate some of the successes of this small but beautiful nation, while also tackling the troubling issues at hand. Independence means little when a large segment of the public is discontent. That is why myself and a group of friends have drafted a statement of support for the people of Armenia and their call to action for positive civic changes and reforms. Western civilization is greatly indebted to the Armenian people. US Congressman Ed Royce stated the abovementioned at Wednesday’s festive event that was held in the US Congress, and to mark the 25th anniversary of Armenia’s independence. In Royce’s words, when celebrating the 25th anniversary of independence of the Armenian state, we need to also recall the more than 3,000 years of Armenian civilization. The US Congress member stressed that, today, their thoughts are on the future of the people of Armenia, and that very strong relations have been established between the United States and Armenia. As per Congressman Royce, the Armenian people’s spirit and their devotion to their culture and values has enabled them to triumphantly turn the darkest pages in the history. Ed Royce added that, today, they hope that Armenian children will have a bright future. More than a dozen US Congress members attended this event.